This was not an easy one. The fact is, I had two exceptional meals back-to-back during our most recent brief visit to the west coast. In Carmel-By-The-Sea, we went to Aubergine, where Chef Justin Cogley does some masterful things with both local products like Monterey Bay abalone and exotica like insanely marbled Hokkaido beef, all in an elegantly restrained, almost Japanese style. The next day, after dropping Mrs. F at the airport (she was off to another conference in San Diego) and visiting Frod Jr. in Berkeley, I still had several hours to kill before a red-eye flight home. So I'd booked an early seating at Michael Tusk's Quince in San Francisco, and proceeded to have one of the most indulgent, pleasurable, flat out smile-inducing dinners I've had in recent memory. (You can see all the pictures from these two great meals in this Aubergine - Carmel flickr set and this Quince - San Francisco flickr set). Both experiences are worthy of further thoughts (I've been jotting down notes), and any of about a half dozen or more dishes from the two nights could easily go here. 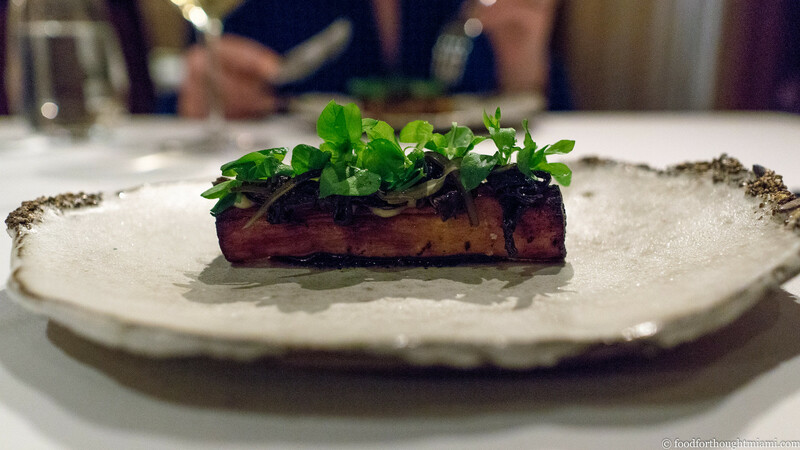 So I've opted for the one that was the most unexpectedly good: a baton of Belgian salsify served at Aubergine, roasted until it had gone slack and almost sticky, shellacked with a dark, dense purée of nori and trumpet mushrooms, all adorned with a spray of fresh, grassy chickweed. There was just such a beautiful intensity and purity to the flavors here, an unexpected beauty in fairly simple ingredients. Ask me another day, and I might instead single out that incredible Hokkaido beef dish, or Aubergine pastry chef Ron Mendoza's beautiful combination of chocolate, walnut, fermented pear ice cream, Amaro Nonino, and wood sorrel, or from Quince, a beautiful dish of caviar, uni and julienned apple, or the zenned-out bliss triggered by the combination of truffle-shrouded pork tortellini and old Burgundy.